To go straight to the best Amazon prices and discounts on the Marcy 150 lb. Stack Home Gym click the link now. Read on for more information. Click on any of the headings below to go straight to a topic of interest. 2 Are There Any Drawbacks to the Marcy 150 lb. Stack Home Gym? 4.1 If the Marcy MWM 990 is your choice click the link to get the best Amazon prices and discounts. The Marcy 150 lb. Stack Home Gym offers a number of attractive features for people looking to get into better shape. It comes with a 150-pound vinyl-coated weight stack. It also has high and low pulley stations, a lat station, and a dual function press arm. There’s also an adjustable preacher curl bicep pad. All of these are great for working the upper body. For example, the lat station is great for getting a lean, muscled back. The dual function press arm lets you do vertical butterflies and chest presses. The preacher curl is very good for working out the biceps. This all-in-one home gym also includes a few extra features that show how much thought Marcy has put into designing it. The oversized roller pads for the leg exercises draw rave reviews on Amazon.com. They make easy leg workouts possible. That’s because the foam rollers are very comfortable. The dual function leg developer with pivot point easily aligns with your knee joints. You won’t worry about working out your legs anymore. You will be able to work out your quads, hamstrings and glutes without fear of leg joint pain. Are There Any Drawbacks to the Marcy 150 lb. Stack Home Gym? If there are any drawbacks to this all-in-one home gym, it’s that there is no attached rowing seat for cardio. So you would have purchase a separate piece of cardio equipment. 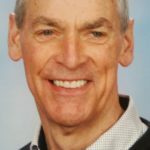 And, for elite bodybuilders, the 150-pound weight stack will not be enough resistance to develop significant muscle mass. 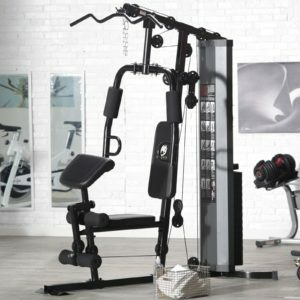 Similar machines come with as much as 210 pounds of weight resistance. In terms of overall construction, the Marcy 150 lb. Stack Home Gym is made of heavy duty, 14-gauge steel tubing. This makes the home gym very durable, but also surprisingly light. It all comes with a durable powder coat finish and just looks very professional and very sleek. That’s not really surprising, given the Marcy name brand. Marcy has a nearly 75-year tradition, dating back to the 1940s. The Marcy name is synonymous with great quality for serious athletes. All products are made in California and Marcy fitness products often show up in gyms, as well as college campus workout facilities. This gym delivers a high-quality gym experience at a relatively affordable price. With the Marcy 150 lb. Stack Home Gym, you can work out every part of your body from the privacy of your own home. Thus, the primary customer of the Marcy 150 lb. Stack Home Gym would be someone looking to get into better physical shape. This means a toned physique and a leaner body, but not muscle bulk. As noted above, Marcy makes a full line of all-in-one home gyms. Let’s see how the Marcy 150 lb. Stack Home Gym compares. 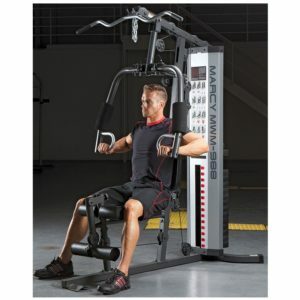 Its nearest competitors are the Marcy 990 Home Gym and the Marcy 988 150 lb. Stack Gym. a solid steel weight stack enclosure. They both enable 30+ training exercises. The Marcy 990 receives slightly higher marks than the Marcy 988 on Amazon (4.2/5.0 vs. 4.0/5.0).The 990 is a slight upgrade on the form and function of the 988. The primary difference between the Marcy 990 and the Marcy 150 lb. Stack Gym has to do with design. In terms of functionality, they are almost completely identical. They both offer easy leg workouts. They both offer 30+ training exercises, and they both offer a lat pulldown. And they both have an adjustable preacher curl for bicep curls. In terms of design differences, the Marcy 150 lb. Stack Gym comes in black and grey, while the Marcy 990 comes in black. Moreover, if you compare side-by-side photos of the two, you can see more differences. The Marcy 150 lb. Stack Gym is slightly larger. It has dimensions of 69 x 36 x 80. The Marcy 990 has dimensions of 68 x 35 x 78. Also, the positioning of the dual function press arm and the preacher curl are slightly different in both. The Marcy 990 has slightly larger seat padding. If the Marcy MWM 990 is your choice click the link to get the best Amazon prices and discounts. The one machine that Amazon reviewers most often compare these Marcy home gyms to is the Bowflex PR1000. (Click the link to see our review). You get nearly the same amount of exercises (30) and a very sleek home gym. However, aside from differences in price, there is one fundamental difference. This involves how the machines deliver resistance. Bowflex uses the patented Power Rod Technology, which works via cables and pulleys. You never have to pick up or move any weights. You simply move the Power Rods to change the resistance, anywhere from 5 to 210 pounds at a time. This gives each muscle a very thorough workout, forcing it to work a full range of motion. Marcy uses a selectorized weight stack for safe resistance training. There is a solid steel weight rack stack enclosure. You never have weights suspended over your body. Instead, there are some cables and pulleys that are connected to the weight stack. However, not all exercises use these cables and pulleys. The preacher curl, dual function press arm and lat pulldown do not. This means you get a slightly different type of resistance when using them. The advantage, according to Marcy users, is that you don’t waste time with cables when switching exercises. It feels much more like working out at the gym. However, you only get 150 pounds of resistance. The Bowflex machines deliver 210 pounds of resistance. You really can’t go wrong with Marcy products. Marcy is known for its high-quality, well-designed home gyms. The Marcy 150 lb. Stack Gym is a trusted, highly rated mid-range gym. It’s for people who want to build lean muscle mass and get a full body workout from the comfort of home. In short, the Marcy 150 lb. Stack Gym is a fantastic way to get a gym-quality workout without paying the high fees of a membership gym. The Marcy 150 lb. Stack Home Gym has a rating of 4.4/5.0 from Amazon.com customers. Click the link to the best price now.